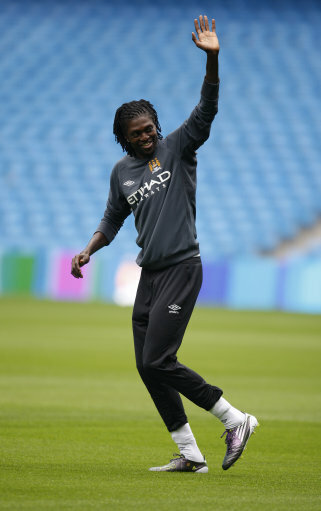 Emmanuel Adebayor Angling For Man City Exit, Any Takers? MANCHESTER City’s big sky-blue meat grinder has apparently claimed another victim with striker Emmanuel Adebayor now admitting that he may have to leave the club during the next few days if assurances over his Eastlands future are not forthcoming. Adebayor returned to the City first-string for last night’s Europa League victory over Timisoara, but is fully expected to return to the bench for Sunday’s Premier League clash with Sunderland – especially if Mario Balotelli manages to shrug off his knee problem in time. “The season is going to be very long and very difficult for myself. I’m a footballer and have to keep going and not give up. I need to keep fighting for myself and enjoying my football. If you’re in a team and you’re not playing, and there is a team that comes in for me, then I will definitely be on my way out because I’m a footballer and I love playing. Forgive my pessimism, but can anyone else see this depressingly repetitive ‘join City as a superstar, leave as a frustrated benchwarmer’ pattern continuing until the sun finally burns out? A fair point, well made. this depressingly repetitive ‘join City as a superstar, leave as a frustrated benchwarmer’ pattern will continue until the sun finally burns out. Like I claimed would happen (although this is sooner than I expected), Man City has become victimized by their talented team and depth. There are many players that would rather play consistent football and have the potential to be a superstar/legend than make the gobs of money that City offers in wages. City is so incredibly deep with talented players who would easily make the first team of almost any club, that eventually these incredible players who have had their egos stroked for so long, will feel like they deserve a shot at starting/more playing time. And when they won’t get it, they’ll want to leave and/or throw a fit and hurt the morale of the club. Normally, I’d say that it’s a good thing to be so deep in players of such great skill that if you lose two or three, “oh well, trade him away and get a equal or a somewhat diminished return on him or loan him out!” But the problem lies with the wages. Most teams cannot pay for the wages that City is paying their players. Yes, a transfer fee can be lowered, but as we saw this season, personal terms (i.e. long term costs) can break down a done deal. Rarely, will players take a wage cut to such an extent. So, City will be forced to lose more money than expected (having to help pay the wages for a player like they did with with Robinho) or be stuck longer with a player who is hurting team morale aka bad news for team chemistry. That’s not even taking in account that a constant in and out of players doesn’t exactly breed comfort, security, or loyalty in players. The way the team is running (players and management) is very mercenary-esque. You’re having established players being pushed out left and right, most of the starting line-up is players that have only been there a season or two, players being replaced within a season or two of being bought once a better acquisition comes along. Just trashy stuff… I don’t know how anyone supporting City can claim to be a dedicated City supporter and not be disillusioned with how the team is being run as your current favorite player statistically won’t make it past three seasons. Also, Arsenal fans, I bet that feels great. But let’s not get too out of line now.